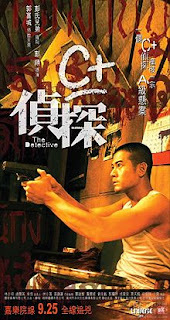 Enjoyed Oxide Pang's Hong Kong neo-noir film The Detective. Not a lot of action but loads of style and atmosphere with a strong streak of black humor. Aaron Kwok plays Tam, a PI working in Bangkok's Chinatown. Tam is hired by Lung, a guy he barely knows from a bar, to find a girl Lung says follows him everywhere and wants to kill him. The C grade detective bumbles into a puzzling string of murders. Absolutely worth a watch but I've always preferred PI stories where the sleuth wasn't a slick badass with a cool car and a black belt and a hand cannon. Keep an eye out for the elephant and some unexpected surprises with the ending.